The headline said it all: "Chili Industry Gains Foothold in the Hatch Community." The Las Vegas Daily Optic of January 17, 1929, reported that the "Farmers of [the] Hatch community, who have developed the chile industry as one which threatens the laurels of King Cotton, are moving out shipments to market." The article reported that just three years prior, only a mere 300 pounds of chile had been marketed in the entire Rincon Valley, of which the Hatch Valley was a part. As of 1929, farmers estimated that 250,000 pounds of chile were being sent to market. The Hatch Valley was on its way to being known as the Chile Capital of the World. True to the nature of a pioneer, the hardy residents of the Hatch Valley have fought against the devastation of floods, the Great Depression, and a changing economy. Their tenacity has made the Hatch Valley what it is today. 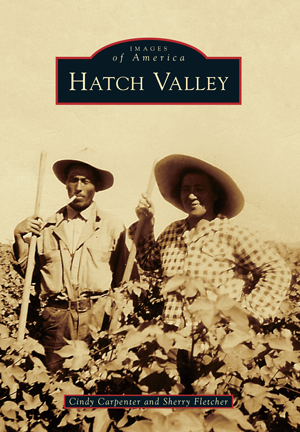 Writer Cindy Carpenter and historian Sherry Fletcher have captured the early times of the Hatch Valley's past through photographs, oral history, and historical newspapers. So whether you are a fan of red or green (chile, of course), they hope you enjoy the walk back in time.